This page explains how to set a homepage in Google Issue Tracker. By default, when you open Issue Tracker it displays a list of issues that are open and assigned to you. In the left-hand navigation, find the link you want to set as the homepage. Hovering over the link will highlight it in gray, and cause a drop-down button to appear. Some links will not have a drop-down button. Click the drop-down button for the link. This button is on the right side of the link, and should not be confused with the expand icon which may appear on the left side of the link. Click the gear icon in the upper right corner of the Issue Tracker UI. In the Preferred Homepage section of the Settings overlay, use the drop-down list to choose what type of page you would like to set as your homepage. 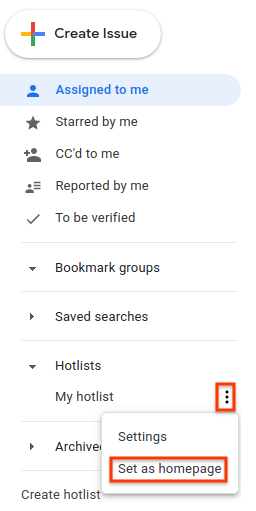 If you choose Hotlist, Saved Search, or Bookmark group, a second drop-down appears. Use this second drop-down to choose the specific list you would like to set as your homepage. You cannot set a specific issue as your homepage. Learn more about Issue Tracker settings.